This tasty slab pie can feed a crowd! Start with our easy-to-make PHILLY pie dough, and top with canned apricots. Place 1-1/2 cups flour in large bowl. Cut 3/4 cup butter into small cubes. Add to flour with cream cheese; cut with pastry blender or 2 knives until mixture resembles coarse crumbs. Shape dough into ball; cut in half. Flatten each half into disk; wrap tightly with plastic wrap. Refrigerate 1 hour. Place 1 disk between 2 lightly floured sheets of parchment paper; roll into 11x8-inch rectangle. Repeat with remaining dough, using 2 additional sheets of parchment paper. Place dough rectangles, with long sides together, on work surface. Discard top sheets of parchment paper. Spray 15x10x3/4-inch pan with cooking spray; invert over dough. Flip pan, holding pan and both pieces of dough together. Remove and discard parchment paper. Gently press dough onto bottom and up sides of pan, pinching seam together in centre to seal. Heat oven to 400ºF. Drain apricots, reserving 1 cup syrup; place apricots in medium bowl. Add tapioca, extract and reserved syrup; mix lightly. Spoon into crust. Combine sugar, nuts and remaining flour in medium bowl. Cube remaining butter; cut into sugar mixture until mixture resembles coarse crumbs. Sprinkle over apricot mixture. Bake 40 min. 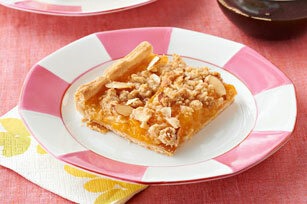 or until crust is lightly browned, and apricot mixture is hot and bubbly. Cool before cutting into bars. Prepare using canned sliced peaches. Since this golden fruit pie makes enough to feed a crowd, it's the perfect dessert to serve at your next gathering of friends or family. Soften remaining cream cheese; mix with 1 cup icing sugar and 1 tsp. milk until blended. Drizzle over cooled dessert before cutting into bars.